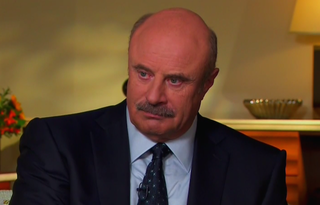 Dr. Phil has an explanation for that sad interview/intervention he conducted with Bobbi Kristina's boyfriend Nick Gordon. The psychologist and talk show host told Access Hollywood he intended to have a rational sit-down with Gordon in Atlanta before it spiraled into an intervention. According to Dr. Phil, Gordon's lawyers said he was "so high, so out of control, abusing alcohol and apparently Xanax" that an interview wasn't possible. "They're concerned for his very life, his very well-being and so much so that the ability to sit down and do an interview with him, his ability to sit down and give an interview, [was] just not an option. That was the whole purpose of going in, to talk to him about how he feels and what he thinks is going on and all of the history about this whole situation... I get there, he is not capable of giving an interview. He is out of control." In Gordon's place, his mom Michelle explained what she knew of what happened with Bobbi Kristina (Gordon was apparently asleep in another room at the time of the incident). "From the time I started interacting with him, he was so animated that he would be talking for a minute, and then he would jump up and run out of the room and [was] knocking people out of the way and pushing people out of the way. So I suspect he had contact with more than two people there. That wouldn't surprise me in the least." After all this, Dr. Phil is open to attempting to interview Gordon again when he's sober. He says, "I want him to sit down, clear-eyed, sober, focused, and answer some very genuine and focused questions about what he knows and how he feels about it."